This short book is intended for two groups of readers, and so is two books in one. 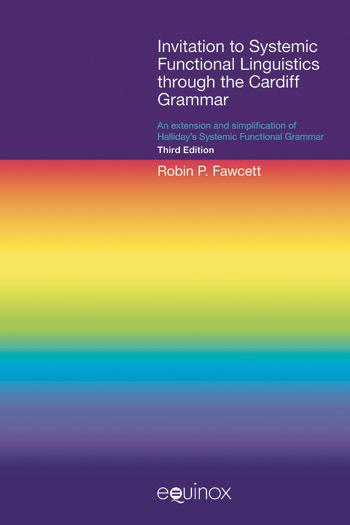 First, it is a genuinely introductory introduction to Systemic Functional Grammar (SFG) for the 21st century. Drawing on recent research, it focusses on the structure of the clause in English, bringing out clearly the ‘multifunctional’ nature of language, and the way in which structures are the result of ‘choices between meanings’. It is both an ‘extension’ of Halliday’s SFG (as in his Introduction to Functional Grammar), e.g. in describing elements of growing importance in the grammar of English, and a ‘simplification’ of it, e.g. in showing how the various ‘strands of meaning’ in a clause come to be expressed in a single structure. But this is also a book for experienced linguists who are interested in a scholarly comparison of the two main current versions of SFG – the Sydney Grammar and the Cardiff Grammar (e.g. teachers of the first group of readers). For each difference between the two grammars, the book describes the Sydney analysis and then explains the reasons for preferring the analysis given here. This ‘book within a book’ is achieved through the use of extended footnotes. Halliday has described developments in the Sydney Grammar since the 1970s as being mainly ‘expansions’ into new areas beyond the grammar itself, rather than ‘reworkings’ of the grammar. In the Cardiff Grammar, however, eight major advances in describing language over this period have led to significant improvements in the description of English (and other languages). Yet the current Cardiff Grammar is still as firmly based in the core principles of SFG as the Sydney Grammar – a powerful tribute to Halliday’s original insights of the 1970s. Versions of this book are being published concurrently in Chinese (by Peking University Press) and Spanish (by University of Plata del Mar Press).